Helps address stress†, and includes Vitamin D3 for bone support, Vitamin C, Vitamin A, and Zinc for immune support, and B Vitamins for energy support. * Explore the benefits of fermented multivitamins. What is Every Woman's One Daily Multivitamin? 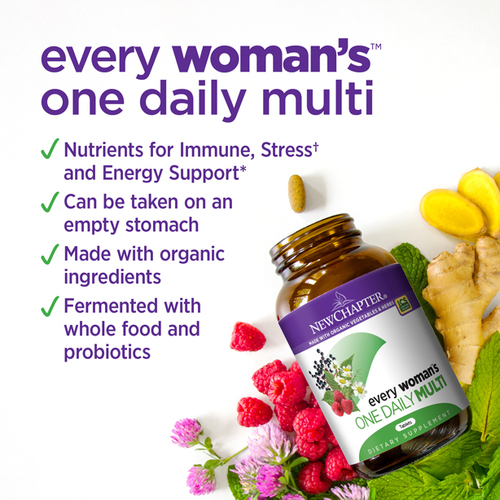 Every Woman's One Daily Multivitamin is designed for active women looking for holistic support, delivered in a convenient once-daily multivitamin. And it's gentle enough to take anytime – even on an empty stomach! What does Every Woman's One Daily Multivitamin do? The whole-food fermented vitamins and minerals in Every Woman's One Daily go beyond just addressing nutrient deficiencies to promote overall health and system-specific benefits. * It delivers superfoods like Ginger, organic Turmeric & Chamomile, expertly formulated for the needs of active women. ‡Not a sole source of this nutrient; a healthy diet is also important. What's in your multivitamin? New Chapter multivitamins are different because they're fermented. We take nutrients and herbs another step with a proprietary fermentation method that uses the vitality and power of beneficial probiotics to activate each vitamin, mineral, and herb. Building your supplement pantry? Check out our family of women's and men's multivitamins to discover which multivitamin is perfect for you! New Chapter multivitamins deliver the studied nutritional benefits of vitamins and minerals from A to Zinc, plus the historic advantages of fermentation. Gentle enough to take anytime, even on an empty stomach.